We love Asian food, especially Thai Garden Rolls and rice pasta, and this creamy vegan peanut sauce is an excellent addition to so many of those dishes. With no cooking required, it can be ready in 10-minutes flat! 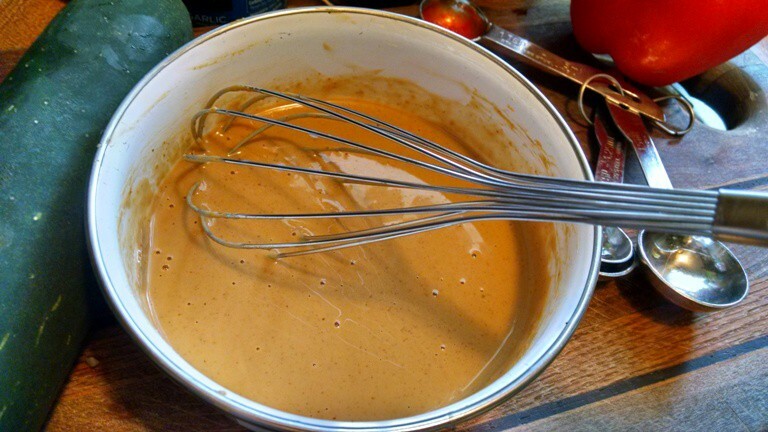 Creamy vegan peanut sauce is delicious as a dip and with wraps. This amazing peanut sauce is terrific on Veggie Bowls too! 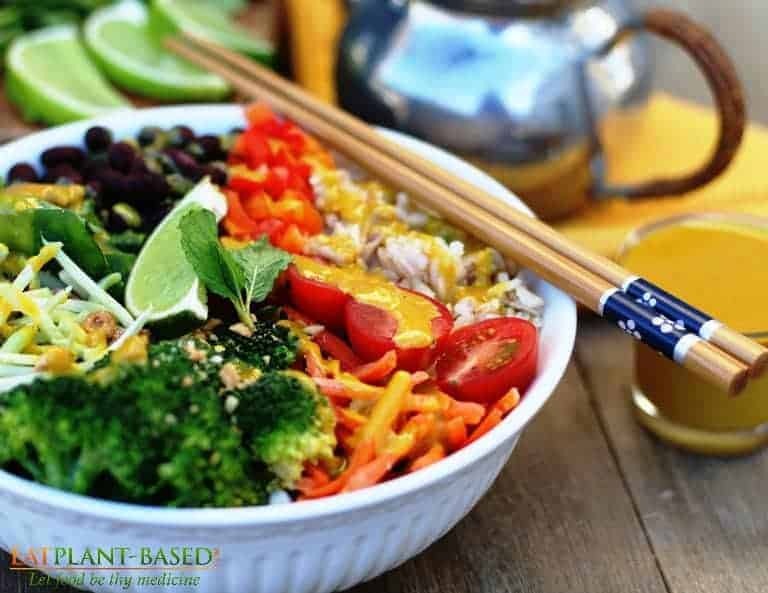 Veggie Bowls are SO delicious with this peanut sauce drizzled over them! 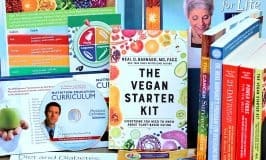 In 2016, I was asked to come up with a special vegetable wrap for the Plant-Based Cooking Summit with Dr. Colin Campbell’s family. 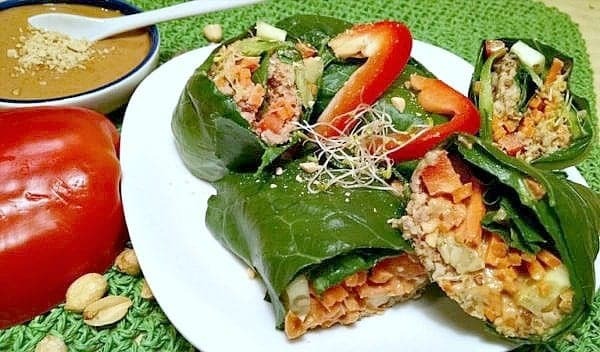 Collard Green Wraps are amazing with this vegan peanut sauce. 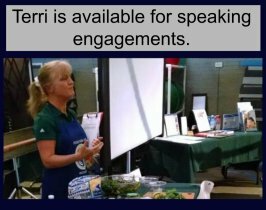 Click photo to see collard wrap recipe. 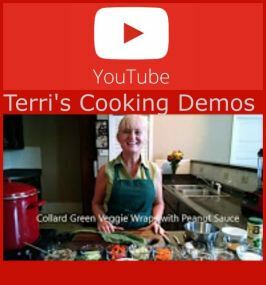 The wrap I created was a Collard Green Veggie Wrap and to go with it, I came up with this peanut sauce. The wraps and sauce were a huge hit at the event. The participants love that there was not cooking and it could be ready in 10-minutes. 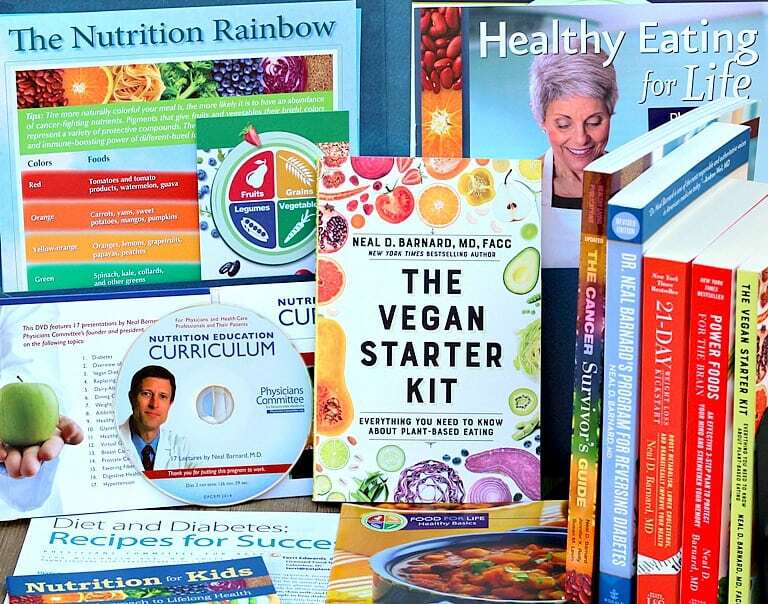 Peanuts are not true nuts, but instead belong to the legume family, which also includes beans and lentils. You can enjoy them raw or prepare them in a variety of ways, including boiled, dry roasted and oil roasted. You can also crush them to make peanut butter or use them in a variety of savory and sweet dishes. 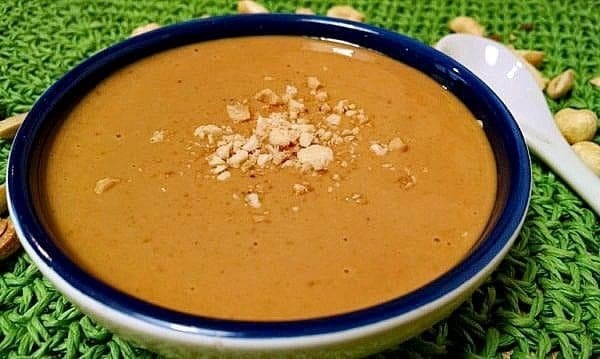 One great thing about this recipe is that it can be made with either natural peanut butter or with PB2 to reduce the fat. PB2 is made by pressing out most of the natural oils from roasted peanuts and then grinding the nuts into a powder. The result is a powdered peanut product that is packed with flavor but contains 85% fewer calories from fat. It can be used as a powder or re-hydrated with water to form a paste. No cooking required. Simply whisk all ingredients in a bowl. Combine all the sauce ingredients in a bowl and whisk together until smooth. If needed, heat mixture in microwave for 30 seconds to allow for easier blending. If it needs to be thinned a bit, just add a little more almond milk. Serve as a dip/sauce for wraps (Collard Green Wrap and Thai Spring Roll recipe links below) , over noodles, or as a salad dressing. It should keep about 2 weeks. PB2 is made from peanuts that have been pressed to the point of removing the fat and oil content but keeping the peanuty taste. The peanuts turn in to peanut dust, and when you add liquid like water or almond milk to them, they get creamy. Regular peanut butter has 190 calories and 16 grams of fat per serving, whereas PB2 has only 45 calories and 1.5 grams of fat. 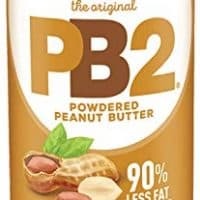 Does PB2 have sugar added? PB2 is an absolutely wonderful invention for peanut butter addicts like myself lol. You can find it at Sams and PB2 comes in a chocolate variety (I found on Amazon) that is good in smoothies. This recipe looks awesome and easy! Thai noodl salad for lunch! I make this with natural peanut butter and it is fantastic. 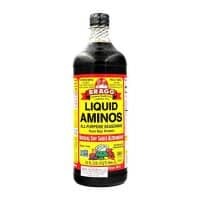 I use it on spring rolls and tofu. I’ve given the recipe to countless friends. Thanks. I love, love, love it!! I have not tried with PB2 but might next time. This is the best sauce. I make it all the time with some natural peanut butter from Trader Joe’s. I have not tried PB2 but might next time. I use it with spring rolls. Perfect! and Easy! Do I need to double the recipe to use it on whole wheat noodles? That would be a good idea, so you’ll have plenty of the sauce for your whole wheat pasta. Enjoy!